When I was in drama school, there was a ‘never the twain shall meet’ thinking regarding theatre and film. However, in recent years, the National Theatre in London have broadcast select works in cinemas worldwide, to allow audiences access to shows that ordinarily they may not get to see, and it has proved a huge success. 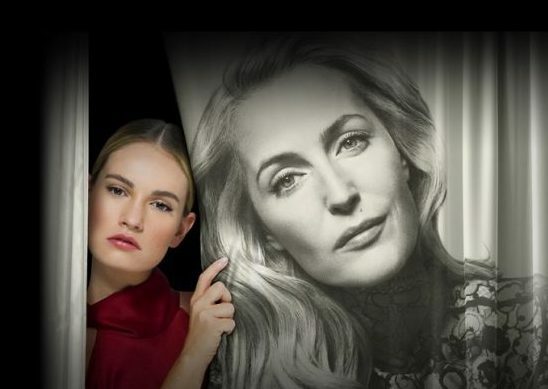 This latest offering, All About Eve, has been wowing audiences in the West End since it opened, helped, no doubt, by the star power of the leads, Gillian Anderson and Lily James. It is based on the screenplay of the classic 1950 movie by Joseph L. Mankiewicz. Bette Davis and Anne Bancroft took the main roles in that offering, and it is still much-loved and lauded, even 68 years later, so everyone involved in this has some big boots to fill. For those not familiar with the story, it tells how theatre superstar, Margo Channing (Anderson) takes a fan, Eve, (James) under her wing, only to discover that the seemingly naïve ingénue has rather Machiavellian side. However, the underlying themes deal with the fragility of the human ego, acceptance of ageing and evolution as a person, the price of ambition, and the high price of celebrity and celebrity obsession. For a film written in the 1950s, it still resonates today – perhaps more than ever – and given its setting behind the scenes in the theatre world, it seems fitting to bring it to the stage. Director, Ivo van Hove, utilises technology to add cinematic elements to this production. At times where characters are in another room it is projected on a screen, while other action is happening on the stage. This is particularly effective when two characters are having a heated encounter in a restaurant bathroom, as their companions dine outside the room, oblivious to what’s been going on. There are also several striking scenes where Margo or Eve looking in their dresser mirror is projected for the audience. This allows Hove to use trickery such as rapidly ageing Margo’s face as she stares at herself, which gives us an insight into her mind-set. Anderson’s Margo is a far more tragic figure than Bette Davis was, and she is definitely channelling the screen great at times. Her performance is laced with pathos and resignation. James manages to balance Eve’s naivety with her cunning and ambition, and cuts a striking figure as her true colours begin to emerge. However, for me, Monica Dolan as Margo’s friend and confidante, Karen, should get special mention. She gives a powerhouse performance, and is the glue that really holds everything together here. Hove stays surprisingly true to the famous script, and there are one or two things that jar a little. References to Eve’s husband in the war – which obviously referenced WWII in the movie – now make you question the era, as the characters’ clothing is classic but contemporary. Also, certain language is very of that era, which discombobulates slightly when spoken by a contemporary-looking character. That aside, it is astonishing how well this motion picture screenplay translates to a stage setting. While this will never be the same as a fully-fledged theatre experience, the opportunity to see a show like this is fantastic. If you can’t get to the real thing, then this is the next best substitute. Obviously you lose the connection of a live performance, but on the plus-side, there are close-ups that you don’t get in theatre, which really reveal all the subtle nuances of the performances. If you can get to London definitely try and make it to All about Eve. In the meantime, the next live show to be broadcast will be All My Sons on May 14th.